Kazakh hunters in Western Mongolia have trained golden eagles to retrieve game in order to sustain a people living in a desolate region. This symbiotic relationship is a form of falconry that has existed for hundreds of years. Scarce resources and limited hunting opportunities make for an environment that forces these two carnivores to work in unison to make the most of every hunt. 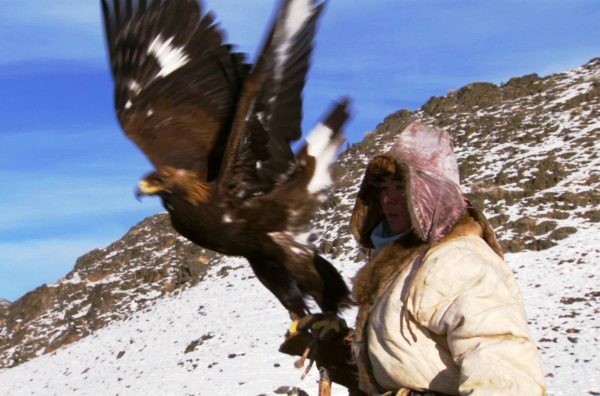 The golden eagle is blindfolded on the morning of the hunt and released from higher ground by a Kazakh riding a horse. When the prey (a fox) is secured by the eagle and its talons, the Kazakh hunter races down the hillside and finishes the kill. The meat is shared by the hunter and the bird, and the hide is used for clothing. Watch this video clip from an episode of Human Planet on BBC and experience the thrill of an ancient hunt.